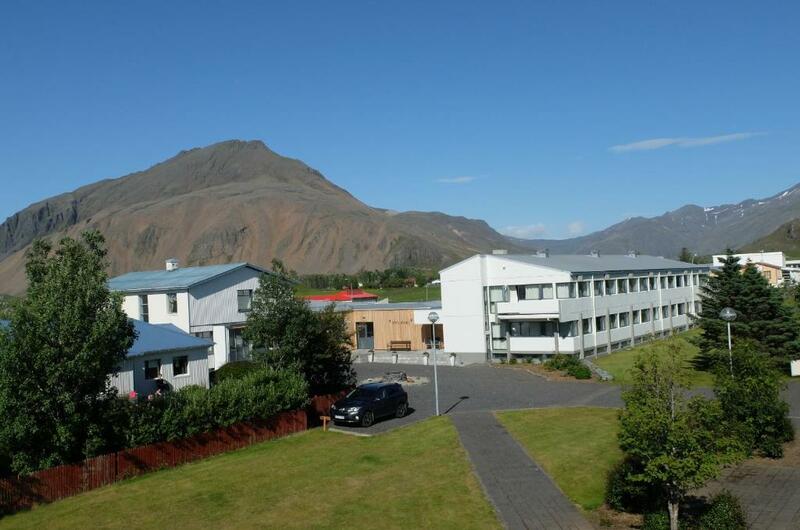 Lock in a great price for Hotel Jökull – rated 8.3 by recent guests! Breakfast was heavenly. Freshly baked breads. Eggs, nuts, fish cereals fruits and lots more. Saw Northern lights which was on our bucket list. The staff was delightful and full of good advice, including an excellent restaurant (Otto) in Hofn for dinner. They also solved a problem I had with a charger, from their lost and found box! Beds were very comfy as well. I was pleasantly surprised with Hotel Jokull (after reading some less than favorable reviews) We (2 adults and 1 teenager) had room 101 which was a corner room which was spacious , no tv.....but a kettle and sink (shared bathroom facilities, no issues with) close reception (not to far to lug all of our luggage) We ate picnic dinners in our room (used the car at night as a fridge!). Good to have a kettle for making thermos of coffee and instant noodle pots. I paid around $200 Au a night, which for Iceland was not bad. The breakfast room although smallish when filled with people had a beautiful view. Breakfast was good. Great place for 2 nights. Its really close for the route and easy access. The breakfast is great and the view is amazing. Everything comfortable and clean. The place was really quaint and very pretty. Staff very pleasant. This is a well run hotel just off Ring Road, outside of Höfn. The room was clean and well kept, and the staff was kind and informative. It’s location is perfect for stopping along your south coast travels (As we did) or visiting the town of Höfn. The breakfast was good. However, I don't suggest going down right when it starts (7am) because it is super packed. Wait like 30 mins, and then go down as it will calm down by then. Location to Hofn was great. Great views. One of our top picks in Höfn.Just 5 minutes’ drive from Höfn in south-east Iceland, this hotel is found along Route 1, close to the country’s largest glacier Vatnajökull. Scenic views and seafood buffets can be enjoyed in the on-site restaurant, which is open during the summer season. Hotel Jökull's rooms have either private or shared bathroom facilities. Each room features basic décor and furnishings. Some have an in-room sink. Free on-site parking is available at Jökull Hotel. Other facilities include a bar, where guests can relax in after a day of sightseeing. The 24-hour reception staff will gladly recommend activities, such as hiking in the Skaftafell National Park or Skalafellsjökull glacier. Jökulsárlón glacier lagoon is a 50-minute drive away. When would you like to stay at Hotel Jökull? Simply furnished room that has a private bathroom with shower. Hotel located in beautiful area, in the middle of major places of interest, at the foot of majestic mountains, provides unbeliveble views, quiet and peace. Distance of 7 km away from the city is ideal option for anyone who's looking for simple icelandic nature, but appreciate the convenience of the city, like shops, bank, post office or swimming pool. House Rules Hotel Jökull takes special requests – add in the next step! Hotel Jökull accepts these cards and reserves the right to temporarily hold an amount prior to arrival. Please note that the restaurant is open from 1 June until 15 September. Very nice hotel. Large, new, and clean room. Good breakfast. Out of town, good for those who travel by car. Good place. I will stay here again. Good service. Fantastic location. Views will be great although the weather was not too kind to us during our stay. Lovely spacious room with s great shower. Coffee facilities in the room where s bonus. Breakfast choices were except. The room is comfortable and bed is nice. Breakfast is quit good. Big room, superb breakfast, good place to see aurora, near to town area for marketing & meals. Walls were very thin, but that may have just been the loud Americans next door! View from room was fantastic. Breakfast was good. “Cold” hotel, no atmosphere. Good TV channel. The views from the room were stunning. The breakfast room and the breakfast itself were amazing too. Breakfast was simple but very nice and fresh.